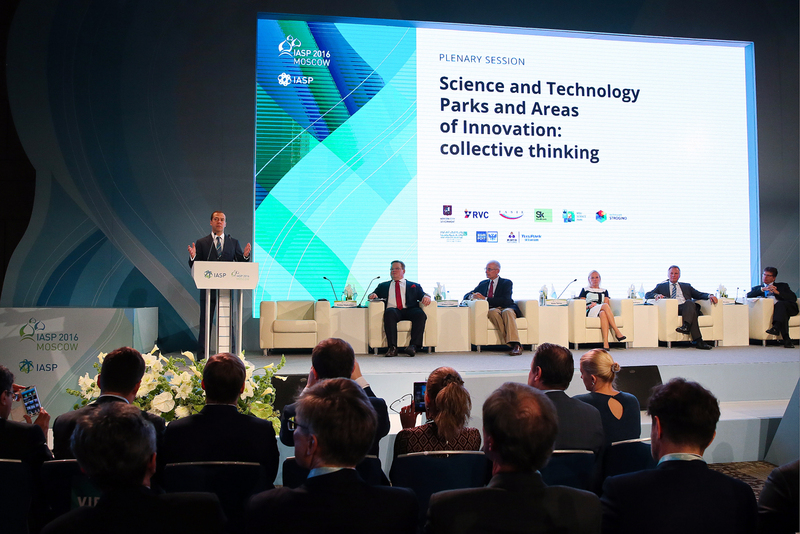 Russia's Prime Minister Dmitry Medvedev speaks at a plenary session at the 33rd IASP World Conference on Science Parks and Areas of Innovation at Moscow's World Trade Centre. Representatives of science parks from 45 countries gathered in Moscow this week to discuss opportunities for startups and the challenges that innovators face. R&D, commercializing new technology, and bringing startups to the global market were the main topics discussed at the annual conference of the International Association of Science Parks and Areas of Innovation (IASP). The event took place this week in Moscow on Sept. 19-22, and focused on technologies that can help solve global challenges such as hunger and the energy crisis. Jerome Engel, adjunct professor emeritus at the University of California, Berkley, pointed out that with the development of technology and globalization it is no longer possible for the institutes of innovation to unite according to geography alone. "Cluster is not a geographic location; but rather, it’s a global community," said Engel in his speech. "We all have to build a bond with others." He added that this will allow science parks across the globe to create "superclusters of innovation," and will allow startups to enter international markets more quickly. Thanks to cooperation with international partners the Moscow State University (MSU) science park has managed to bring the Russian startup Lumiprobe (in Russian) to the global market. The company produces molecular biology and diagnostic reagents and is currently operating in 30 countries. In Europe the startup opened an office in a technopark in Hannover, as well as one in the U.S., in the state of Florida, said Oleg Movsesyan, head of MSU's science park. This only became possible after the park joined the IASP community in 2008 and established contacts with many partners around the world. While Internet technologies and the sharing economy have already made it easier for Russian startups to enter international markets, Movsesyan said it's still easier to go global with the support of a science park. “Of course, dynamic companies do not need partners: for instance, our resident Jivochat, the developer of the online chat, independently entered markets in the U.S., Latin America, India, Brazil, and Portugal," said Movsesyan. "Unless we actively develop platforms for interaction and an international network of technoparks, we may lose this market because the Internet already makes it possible to do everything without intermediaries," said Movsesyan. There are currently 26 technoparks in Moscow, and by the end of the year applications from 20 more innovation zones will be considered. Prime Minister Dmitry Medvedev said in his address to the IASP conference that Russia has different models for innovation, including clusters, science and academic towns, which were created back in Soviet times. "Events such as this conference allow us to compare these models, to learn of successful examples of commercialization and launching startups," said the Prime Minister, who added that the Russian government had recently launched a program for development of so-called children’s science parks to foster a new generation of entrepreneurs. Medvedev also spoke about Skolkovo, the Russian equivalent of Silicon Valley that is supported by the state. He pointed out that "the level of complexity of R&D there is rising." Paul Krutko, president of Ann Arbor Spark in the U.S. and member of the board of the IASP, said he was impressed with the thought process behind such projects as Skolkovo. While traveling to other countries he noticed that some technoparks forgot the need to develop an ecosystem for startups. In Skolkovo, however, a full-fledged ecosystem has been created. "A top down innovation strategy is not bad if you are not just building facilities, but also creating the whole environment for the innovation community," Krutko said. The IASP’s Moscow conference was the largest in the association’s history, attended by more than 1,000 representatives of global institutions. The conference was organized by the Moscow City Government, the Skolkovo Innovation Center, the RVC government fund, the Foundation for Assistance to Small Innovative Enterprises, the MSU Science Park, and the Strogino Technopark.